Is Your Roof Ready for A Winter Storm? The National Weather Service has once again updated snow predictions for Hampton Roads, putting the majority of the Southside under a Blizzard Warning. There is a potential for 12+ inches in some areas overnight, raising the question, is your roof ready for a storm of this magnitude? Fluffy, fresh snow can weigh as little as three pounds per square foot vs. 21 pounds for wet, heavy snow, according to FEMA. Most roofs can withstand 20 pounds per square foot of snow. Ten inches of fresh snow equates to about five pounds per square foot, meaning most roofs in good condition can withstand nearly 4 feet of snow. Signs of a stressed roof are sagging ceiling tiles, popping or creaking noises, jammed doors or windows, cracked walls or ceiling leaks. With this storm, they are not only predicting snow, but the potential for ice and heavy winds making ice dams likely. 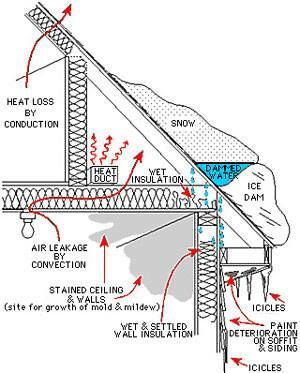 An ice dam is a ridge of ice that forms at the edge of a roof and prevents melting snow (water) from properly draining off the roof. The water that backs up behind the dam can leak into a home and cause damage to walls, ceilings, insulation and other areas. Tidewater Roofing is here to help and always wants you to stay safe. Please do not climb onto your roof to clean off snow and ice. Give us a call if you begin seeing problems at (757) 244-0000 or request an estimate online. In the event the office closes, we will receive emails from our 24/7 answering service, and will return calls as soon as we are able to open the office again. Stay safe and warm out there! While we do offer emergency service, we must keep the safety of our team in mind and will not send our teams onto roofs during the storm or onto steep slopes. If you do have an emergency, we will do our best to assist you as long as it is safe for our technicians.